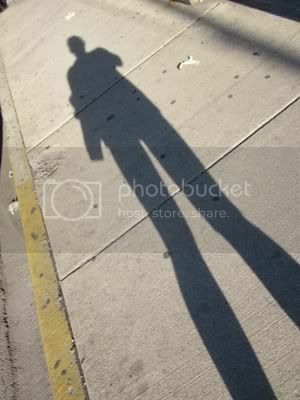 This picture is totally unrelated to the rest of the post, but I love it - I walked home from the gym last night because I had a lot of energy and wanted to fully soak up the first sunny day in what feels like forever, and I was marveling at my shrinking shadow. Man, I love my legs! I made a Spring Fever Challenge goal to complete three items on my 101-in-1001 list. Last week, I was able to cross two items off the list - awesome! Also awesome: I've completed two more this week! #70 was to buy flowers for a friend or family member - I bought flowers for my friend Ellen. We were grad students together, then we both were hired as lecturers, and now (or at least until next Friday) we share an office. She is in the same position as me job-wise, and so I got her flowers to thank her for being such a great friend and to wish her good luck with her job search. I also set in motion #48 - take a completely spontaneous weekend getaway. I woke up yesterday and felt this impulse to check and see how much a flight to Connecticut was. I found a ridiculously cheap one, so I called my best friend and asked her what she was doing this weekend! By the time this post goes live, I'll be in the air, heading for a few glorious days with Jill. It's supposed to be gorgeous this weekend, and I can't wait to run around and just have an amazing time. We're going to have a picnic at our favorite park with one of our other good friends as soon as I touch down around 10:30, and I'm unbelievably excited. The last time any of my friends from home saw me I weighed 345 pounds, so this ought to be a fun reunion! Not to mention the perfect relief for my recent stress. No recipe tomorrow, and my SFC update will be posted later than usual on Monday. I'll be back Monday morning, with stories and pictures and hopefully a little color in my face from taking in all of the glorious East Coast weather. fabulous, you totally rock! have a wonderful/healthy/fun trip! So much fun! Hope you have a blast! What a great idea! Have a wonderful time! ps. your legs look great!!! !